Saving money and making life easier are always at the top of any busy mom’s list. One way to accomplish both is by using the Ninja NJ600 blender to not only make quick and easy healthy snacks for the kids, but to also save a few dollars doing it. Most moms know that bottled or pouched fruit smoothies of any brand are not cheap and even if you hold out for a sale or use a coupon a two, the price will often make you cringe. Instead of digging deep into your pockets, moms can use the three-speed Ninja NJ600 blender to create a variety of smoothie flavors and also not have to worry if their child’s favorite banana-strawberry smoothie is out of stock in the supermarket. Smoothies are not only popular among most kids, but they are also healthy, full of vitamins and fiber and low in fat, according to a CNN report. They are also easy to make either following a recipe or letting the kids use their imagination to create whatever suits their palate at the moment. The best place to start is by purchasing a reusable container to put your smoothie creations for your kids in and then head to the supermarket to purchase a variety of fruits and veggies to make smoothies with. A simple recipe to start with is blending 2 cups of Greek yogurt with 1-2 bananas, 1-2 cups of strawberries with milk or water. If you kids are like most children, the thought of eating greens makes them want to run for the hills, but with a Ninja NJ600 blender, which features a BPA-free 72 oz pitcher, hiding veggies is easier than any mom could imagine. A great way to start is with pasta sauce, which most all kids enjoy eating. Simply use your Ninja NJ600 to finely chop up one bell pepper, a zucchini and baby spinach, which you can add to a pre-canned sauce that you can simmer in a pot for 20 minutes before serving or add the blended veggies to a fresh tomatoes sauce. Either way, your kids will never know you added fresh veggies to their spaghetti sauce. You can also use the sauce to make another child favorite — pizza. Since the Ninja NJ600 is powerful enough to mash potatoes, which most children enjoy eating, moms can use their blender to hide the unpopular cauliflower. To make this recipe, boil potatoes and cauliflower together in a pot for about 20 minutes, strain and then place both the potatoes and cauliflower in the Ninja NJ600, add butter, milk, salt and pepper and blend on setting 3 until the consistency is to your liking. Your children will never guess that their mashed potatoes are laced with cauliflower. Getting children to take their vitamins is not always an easy task, but doctoring them up using a Ninja NJ600 blender just might make the chore a bit easier. Applesauce is a perfect place to disguise vitamins and is simple and inexpensive to make using the Ninja NJ600. To prepare the recipe, all you need are four large apples, peeled, cored and quartered, water, honey and a dash of cinnamon. 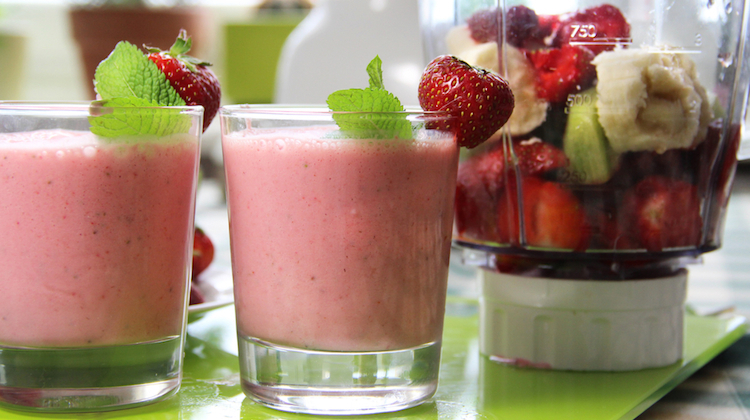 Place all the ingredients into the blender and mix until smooth. Then, mash up the vitamins and mix them in with a dish of applesauce, which can be served at room temperature or chilled. Blender and fruit in glasses image courtesy of Shutterstock.